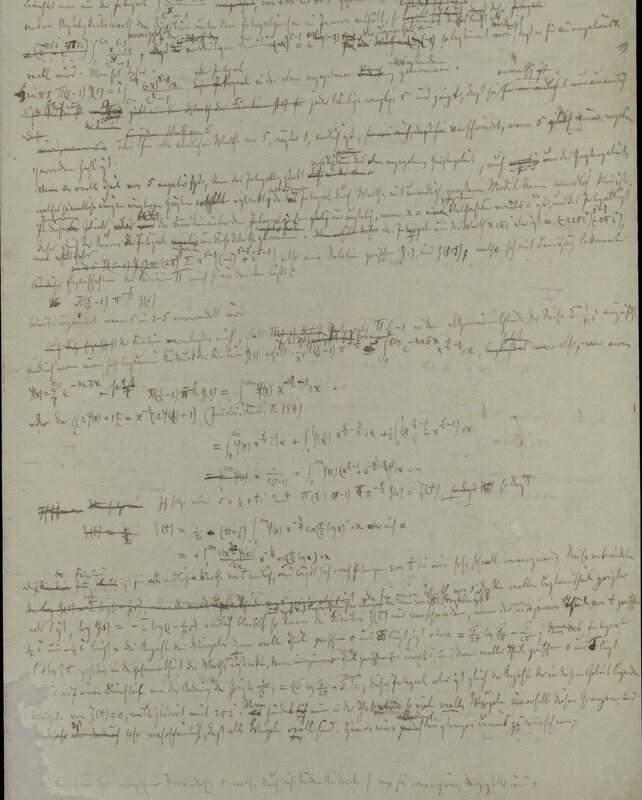 For some years, CMI has had on its website a manuscript that was believed to be Riemann’s draft of the 1859 paper in which he set out the Riemann Hypothesis (SUB Göttingen, Cod. Ms. B. Riemann 3 : folio 16r; manuscript A). At the suggestion of Wolfgang Gabcke, it has now been replaced by an earlier draft of the paper (SUB Göttingen, Cod. Ms. B. Riemann 3 : folio 19r – 20r; manuscript B). CMI is grateful to Wolfgang Gabcke for suggesting this change and to the Göttingen State and University Library for permission to post both manuscripts on the CMI website. There appears to be no doubt that MS B is an early draft of Riemann’s 1859 paper Ueber die Anzahl der Primzahlen unter einer gegebenen Grösse and that it is in Riemann’s own hand. In correspondence with CMI, Erwin Neuenschwander pointed out that it is dated October 1859, the month in which Riemann submitted his paper to the Berlin Academy, and that it differs in some respects from the printed version, in particular in the omission of the first paragraph of the final version. The handwriting matches that in other manuscripts in the Göttingen Library that are known to have been written by Riemann. The date on MS B is difficult to decipher. The origin of MS A is less clear. It is certainly a fair copy of the 1859 paper, in Latin script—in contrast to the German cursive (Kurrentschrift) of MS B. Samuel Patterson remarked in correspondence with CMI that “In writing a fair copy the handwriting could vary from the day-to-day handwriting. It was not uncommon for people to have more than one script. In Gauss' letters he uses a different script for German and for Latin/French—in the same sentence.” However it is more plausible that MS A is not in Riemann's hand. Wolfgang Gabcke points to the close similarity of the handwriting in MS A to that in a letter written by Alfred Clebsch to the publisher B. G. Teubner of Leipzig, which is also in the Göttingen Library (SUB Göttingen, Cod. Ms. B. Riemann 1,2, sheet 5). The letter is dated 25 October, 1872, and so was written 13 days before Clebsch died. Erwin Neuenschwander concurs with the view that MS A was written by Clebsch. It may originally have been a copy made for personal study but, as Neuenschwander suggests, it appears to have been used in connection with the preparation of Riemann's collected works (Bernhard Riemann's Gesammelte mathematische Werke und wissenschaftlicher Nachlass, R. Dedekind and H. Weber, 1876). He points to the Roman numerals written in pencil at the top of the first page: X (crossed out) and VII, the 'VII' indicating that the paper was to be the seventh in volume, which indeed it was. The collected works were published by B. G. Teubner, and Clebsch's letter refers to them. The introduction to the collected works identifies Clebsch and Dedekind as the original intended editors, so the probable sequence of events was that Riemann's papers were passed to Clebsch by Dedekind (Riemann's literary executor). Clebsch then sent his own notes to the publisher just before his death. The whole collection was subsequently given to Heinrich Weber, who took Clebsch's place as co-editor after his death. With thanks to Wolfgang Gabcke, Erwin Neuenschwander, and Samuel Patterson for shedding light on this intriguing story. Wolfgang Gabcke has written a detailed account of this history in On a fair copy of Riemann's 1859 publication created by Alfred Clebsch.